Maharashtra emerges as the most innovative economy overall. The most innovative economies are Maharashtra, Tamil Nadu, Karnataka and Gujarat. In different categories Delhi, Uttarakhand, Goa, Sikkim and Mizoram emerge as top performers. Innovation comes from the latin word innovationem which means “to change; to renew”. Innovation thus described means “a novel change, experimental variation, new thing introduced in an established arrangement”. Innovation process has been old but the discipline is relatively new. The India State Innovation Report 2016 envisages and looks holistically at the innovation landscape of India. It broadly seeks to conceptualize, understand and look at the contours of India’s Innovation landscape. It also seeks to present a conclusion, remedial steps and changes required to enhance India’s innovation capability. 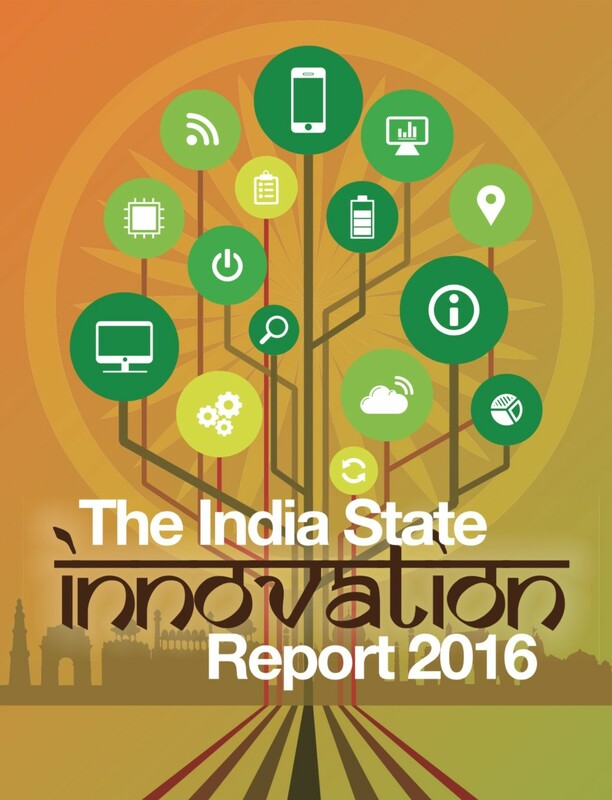 The report also has a State Innovation Index, which seeks to measure innovation environment across states in India. Categorization is done on the index according to a stage of development with eleven indicators being used for building stage of development. 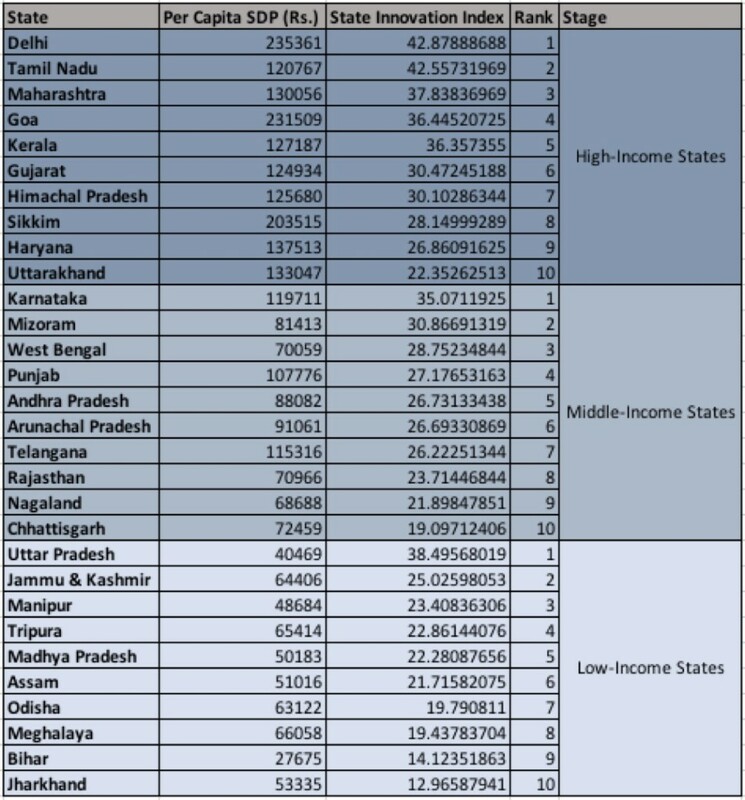 At the top of the Index are states like Maharashtra, Tamil Nadu, Karnataka and Gujarat. However, it must be said that these states also pale in comparison to states and regions globally which are deemed as innovation hotspots. These states have been innovative largely because some locations and cities within these states have become innovative. Overall the index seems to tell that the innovation environment is strong regionally in south and western parts of India. Thus there seem to be a west-south and north-east divide. Delhi and Uttar Pradesh seem to be an exception to this rule and seem to be doing well on the Index. States in peninsular India seem to be doing well on innovation environment. 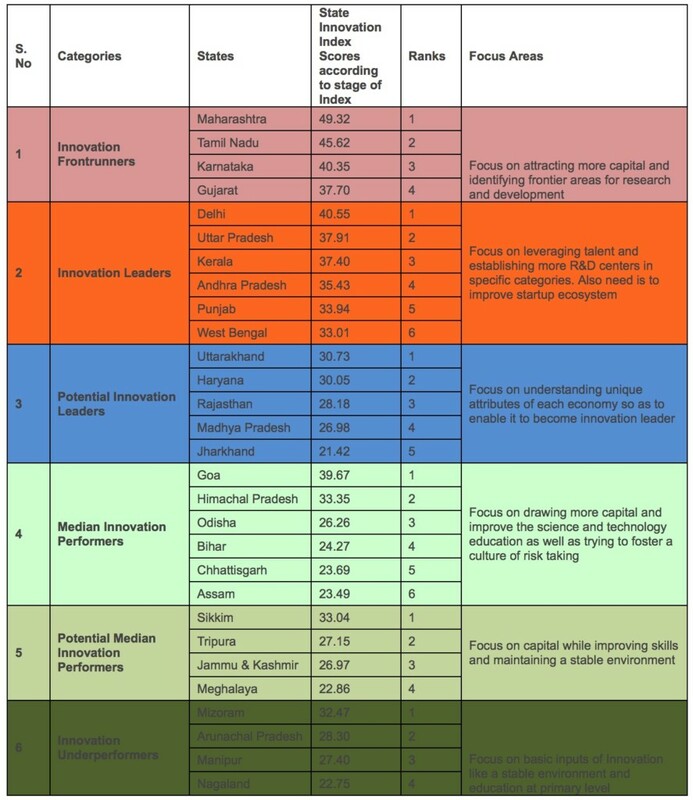 In various categories stacked from the most innovative to the least innovative states like Delhi, Uttarakhand, Goa, Sikkim and Mizoram emerge as the top performers. Innovation as a paradigm is of huge concern for a country the size of India. It is because innovations are important from several viewpoints. These include solving certain problems in society either by companies or by individuals using innovations. Innovations are also important from the viewpoint of economic growth. Technological innovation forms the basis of industrial development and growth and competitiveness of nations. Several countries have invested greatly in R&D efforts and these have helped reap rich dividends. It is because such efforts have been instrumental in the development of inventions that lead to innovations and globally competitive industries over time. Broad level learning and some policy imperatives at the national level include increasing the spending on R&D at a national level, improving capability of top rung educational institutions in India like IIT/IIM’s to produce greater innovation outputs. The need is also for greater coordination and collaboration between national CSIR labs and the educational institutions for enhancing innovation capability. The issue is also lack of technology transfer mechanisms between labs and industries. Another important issue at a national level is to constantly upgrading and design better laws and policies on crucial areas like industrial policy, intellectual property, foreign direct investment, etc. Another learning if for innovation to be important at a national level it takes long-term policy orientation even in the wake of newer governments. Decade long innovation policy can become a reality only with all stakeholders being convinced on innovations being central to competitive economies. At the state level, broad level policy imperatives and key learning includes finding a balance between technology push and market-oriented technology development. Another important finding is lack of linkages between state level universities, MSME’s and R&D institutions. Another important find is few policies exist that seek to improve the innovation and entrepreneurship ecosystem at the state level. Cluster development programs are also an area badly in need of greater coordination and can benefit with a more open collaborative approach. Also, industrial policies at the state level need to focus more on innovation. At present few policies exist for innovation even in the most innovative states with the exception of Karnataka. At a sectoral level some things have worked and some have not. An overarching theme is that sectors, which have seen more openness and collaboration with domestic and foreign private sector, have been able to reap rich dividends with several research labs coming up in distinct locations and the sectors becoming globally competitive over time. These include sectors like automobiles, pharmaceuticals, food processing and biotechnology. The defense production sector has had several checks both on its technology development organizations such as DRDO and its production organizations and this has had a tremendous cost. It is because India has had to import a lot of its defense equipment and this has a bearing on not just the sector being relatively uncompetitive but also in terms of the costs of procurement from outside being high. Another important point is that the teaching and research ecosystem around the sectors does have a positive impact on development of sector and sectoral innovation.